We developed Total Audio Converter to fulfill all you audio conversion needs. First, it supports WAV, MP3, APE, FLAC, OGG, MIDI, WMA, MP4, AAC, MPC and 20 more audio formats. Whatever format you will need to convert, TAC'll do that. Second, it is extremely easy-to-use but still very powerful. And the price ($19.90) for an all-in-one audio converter with built-in CR ripper, audio player and command line support is quite fair, isn't it? 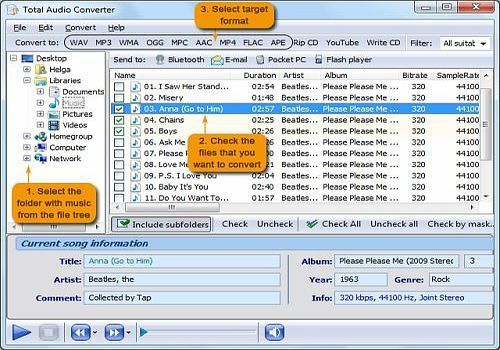 New CD - MP3 Ripper is a utility that is used to extract an Audio CD to your computer in MP3 format.